In a few hours I will be on a plane bound for New York. I close my eyes and my mind travels back to a June day on that MTA Hudson line between Highland Falls and Manhattan, the day before I left the U.S on a one way ticket. The train is stalled on the tracks, suspended between certainty and possibility. I am propped up on my backpacks gazing out the window as I wait for the final whistle to sound and the doors to close. I try hard to focus on my own reflection in the glass rather than my fathers face behind it, I can’t bear to see it teary-eyed and strained. I try to distract my mind so I don’t cry or let uncertainty creep in, “you are used to this” I tell myself. He waves at me. He blows me kisses and shoots me sad smiles as I hear the train conductor give the final call, final stop: Grand Central. My father often knows me better than I tend to know myself. Even though I was sure I would return in three months or so, his tears indicated it would be much longer. He was right. Now nearly six months later (to the day), I am returning to the East Coast for a short holiday. That last Manhattan bound train feels like so long ago. Everyone has shed their summer skin and the trees in the park outside my apartment have become bare too, their branches like skeleton hands shaking in the wind that sweeps off the sea. I will go to the home I left in New York, and after a few weeks I will return once again to the new home I’ve made here in Thessaloniki. It’s a home I’ve carved out all on my own. I will return to the people I’ve spent the last couple of months getting to know on evenings that lasted well into the morning. We have spent nights fumbling around in the dark with our words, trying to find common ground to latch on to. I’ve dug for personality traits and quirks and stories that might reveal connection, excavating souls like a clumsy archaeologist. I will return to the post-graduate program I enrolled in on an impulsive and pivotal Tuesday last October. I will return to walks along the seafront and my empty abandoned backpack stuffed under the bed. I will return to my new life here, but first I will return to New York. 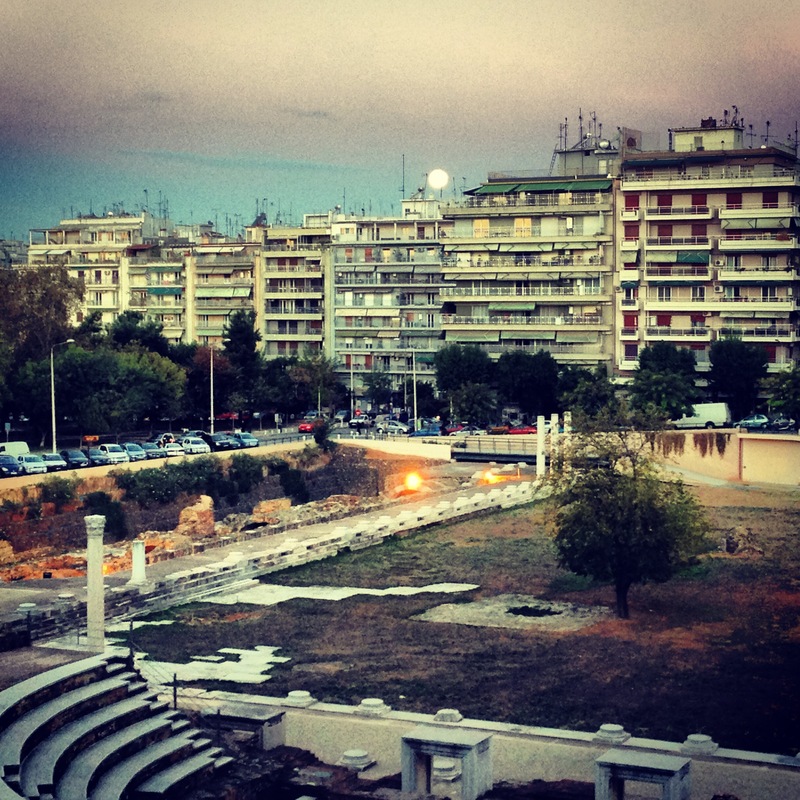 Last time I wrote I was crying in a visa office, sure that I would be forced to leave Greece. I spent the following two hectic weeks in Athens bouncing between hostels and family, pleading with more immigration officers. I met a stranger named Liam who read my heart as we sipped Ouzo in the ancient part of the city. He had the misfortune of running into me when I had hit rock bottom, when I was at the pinnacle of my confusion about the future. He listened to me patiently, he told me he was on his way to Egypt to scuba dive and live with the Beduin. We decided circumstance was just as good a reason as any for two strangers to have dinner together, and he encouraged me to go after what I wanted unabashedly. I remember the Parthenon looking incredibly beautiful yet intimidating that night. For some reason its timeless, enduring, commanding, presence only emphasized how fleeting and unsure everything else felt. Back then I couldn’t have fathomed I would be where I am today. I come from a military family that has become good at separation, and six months of absence is by no means record-breaking. Yet the last six months have been so packed with experiences and changes I am finding it hard to prepare myself for the return. What is it that I left behind again? Why did I leave it? How did I get here? I didn’t move six months ago – I anticlimactically walked out the door, took a long, lonely, taxi ride to the airport with a backpack full of enough clothes to last 3 weeks, and then just didn’t return. I told myself I would write stories, collect them, refine and shine them into tiny pearls, and then I would crack myself open like an oyster for others to read. I told myself it is good practice – for what, I am not exactly sure yet. I think about all the stories I am unable to tell, ones I convince myself I could not possibly convey. Flashes of trains through the German countryside, food-poisoning and a new friend in a Barcelona hostel, chasing after a thief in Italy, sailing into Greek ports all dance in my head. After it all, I am filled to the brim with stories. I hold and hide them like cupped hands around candle flames; I want so badly to share their light. I have to at least attempt to reveal a glimmer, for my own satisfaction. So as I prepare to return to the familiar, I figure I might as well return to this old thing again too. I have spent the last few months challenging myself to study, make new friends, explore my new city and yet I abandoned my writing – i suppose there is a limit to how vulnerable one can make themselves feel all at once. And yet I have missed writing, and the terrifying discomfort that comes with it, leading to discovery and growth. If there is one thing I have learned in the last several months, it’s that the more raw and exposed we make ourselves, the better.